Sentient Developments: Coalition governments in Canada: The new normal? Coalition governments in Canada: The new normal? What do you get when you put a federalist, a socialist and a separatist in the same room? Well, if you're in Canada you get a ruling coalition government. By this time next week it is expected that the minority Conservative government will be overthrown by an alliance comprised of the Liberals, NDP and Parti Quebecois (although technically speaking the PQ will prop up the government and not be a part of the coalition). Much to the surprise of many Canadians, this is a completely constitutional course of action. And it's happened before; the Liberals and NDP toppled Joe Clark's PC government in 1979. If all goes according to plan, the newly formed coalition will put forth a vote of non-confidence next week and a new government will take its place (unless the Governor General calls for an election, but that is highly unlikely given that the last election was only 6 weeks ago and that the economy is in a sorry condition). Part of the concern stems from the feeling that the vote of non-confidence is unwarranted. Critics feel that this is nothing more than sour grapes and opportunistic power-grabbing. On this point I'll disagree for reasons elucidated in my previous post; the Harper regime is a mess of contradictions and a band of phonies who have chosen to rule with arrogance and indifference during a time of economic crisis. But further to the point of parliamentary coalitions, what many Canadians have failed to realize is that this has been fairly inevitable: The face of Canadian politics is changing and coalitions may become a regular fixture of parliament. There was a time when there were only three players in town, the Progressive Conservatives, the Liberals and the New Democratic Party. Today there are 5 viable parties, including the addition of the startlingly influential Parti Quebecois and the up-and-coming Green Party. This has caused the left to fracture, a turn of events that has greatly benefited the only true right-wing party in Canada, the Tories. We've also been somewhat immune to the reality of coalitions here in Canada. In Europe it’s par for the course. Take Italy, for example, in which there are typically no less than a dozen parties that can comprise a government. Indeed, this can often make for strange bedfellows, but such is the nature of parliamentary democracies. And in such systems, voters may get to choose who goes to parliament – but it's the parliament that gets to choose the government. One telling point which is true in Canada, if somewhat misinterpreted, or forgotten. We are a representative democracy, which means we elect members to Parliament, who then decide on our behalf. This is amply demonstrated by the fact that we vote for a local candidate on our ballot on election day. It was only in recent elections that party affiliations even appeared on the ballot. To claim that canadians voted for a Conservative government, and any other coalition is anti-democratic is simply not the case. 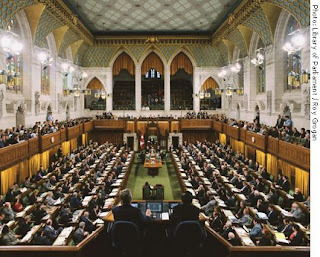 Canadians sent representatives to Parliament, where their job is to elect a government. It is called gaining the confidence of the house. (Winning a majority of votes in Parliament). The Conservatives won the confidence, and then promptly lost it when the majority of the house felt that they abused this position. This isn't sophistry, it's the mechanics of how we are governed. Australia was ruled by a coalition government for 11 years. Prior to the election of the liberal Labor government we had the conservative Liberal-National coalition. I think it's a bit of a stretch to call either the Greens or the Bloc "viable" parties. The Greens have never won a seat and that's not likely to change anytime soon. They're not a part of parliament. The problem here is, this is in no way "illegal", but in many ways seems "illegitimate". The Liberals and NDP on their own do not have enough seats to form a government. They need to make a deal with the devil, the separatists, to make this happen. This is not a Liberal/NDP coalition, its a Liberal/NDP/Bloc coalition. I have my issues with the Harper government as well, but not enough to consider toppling it only 6 weeks after the election, not to mention replacing it with an unholy Socialist-Separatist alliance, part bent on bankrupting the country, the other part wanting to destroy it. I'd rather spend the 300 million on another election than see the 30 billion dollar payout from our pockets to friends of the Liberals and NDP such as the suicidal auto-sector. It certainly makes for interesting times, and it is true that in Europe and other places it is very common to have many, many parties, blocked together in varying coalitions. But personally, I'll be pretty queasy seeing such an unpopular leader as Stephane Dion (unpopular not only with Canada, but his own party), take control, with the rest of the left carving up their own ministerial and senate seats willy-nilly. I don't think Canada will stand for it, and an election will happen quick anyway. 1) I'm sure you are aware that the Parti Quebecois propped up the Tories for the last 3 years, including 18 consecutive confidence motions. Can I assume you had the same issue with that arrangement? Consequently, it is a hypocrisy of the highest order for the Tories to be making the "in the bed with separatists" claim. 2) Dion is on his way out, so your claim is overstated. All I know is, I've gotten more emails and read more press releases from political parties in the last few days than during the actual election! I do not see the Governor general taking responsibility for this change. Parliament has been suspended into January. There will be a new budget then and both sides will campaign until the showdown. The no-confidence motion will pass and then it will be new elections. If the Lib/NDP/PQ have a combined majority then they will have their new government. I find the coalition's justification to be rather transparently false. The coalition's claim is that they are doing this to save the Canadian economy, in the face of Conservative inaction. Surely they cannot fail to recognize that the Canadian economy, being so heavily dependent on exports of commodities and manufactured goods, relies on foreign confidence in our markets and foreign investment in our companies. I fail to see how introducing constitutional crisis and political instability into the workings of the Canadian government can have any but a negative impact on both of these. Indeed, we've seen the TSX continue to decline in the face of this crisis, despite many world markets showing some small gains. It cannot - in all fairness - be laid completely at the feet of the coalition, but their political posturing and their attempt to seize power has had a direct and negative impact on the very economy they are claiming to be protecting. Given this, I cannot see how reasonable people can view this as anything other than an attempt to prop up the failing political fortunes of the Liberal and NDP parties, with the current economic crisis being used as a convenient banner around which to rally.